This is going to be a busy week for Yoders’ Farm… which means we need to share some details with you! There are three things we need to cover in this blog post. This Saturday is Farm Day! We’re open Thursday Nights on the Farm in October! As per usual… I don’t want to take up too much of your time with more words than necessary. So let’s get right into it! They got in touch with us a few months ago and wondered whether we would have some pumpkins, which we do. One thing led to another and… well… If you are one of the first 100 kids through the line at the Pumpkin Party, we’ll be there to hand you a free pumpkin! Sounds like a good time to us. We’d love to see you there! Also check Chick-fil-a Wards Road out on social media. For the past number of years we’ve had an event called “Family Farm Day.” We did it once or so in the Spring but it officially became a fall event a few years ago. Well, this Saturday is this years Family Farm Day! We often get asked what makes Family Farm Day “different” than any other Saturday throughout the fall season. It’s a valid question… one that I hope to help clear up below. The normal “Corn Maze” things are still available. So anything listed over here on the Corn Maze page is available as per usual. From the time of opening (10 a.m.) till around 2 p.m. we have a number of extra things/activities available. This year’s list is a bit smaller than past years due to a number of scheduling conflicts but the following is our current list. Pony rides from our friends at Patrick Henry Family Services. I believe the cost last year was $5 for 5 laps. I believe it will be the same or similar again this year. All proceeds from this will go to Patrick Henry Family Services. They also plan to serve some food items. Kiddie Train Rides will be run by some friends of ours from church who put on a Bible School on an Indian reservation in Canada each year. The cost for this will be $1 per ride and proceeds will go to them. The local chapter of the 4H will be here with several hands on, fun, educational activities. We don’t have a lot of details on cost if there is any. After 2 p.m. things go back towards a normal Saturday afternoon’s activities. 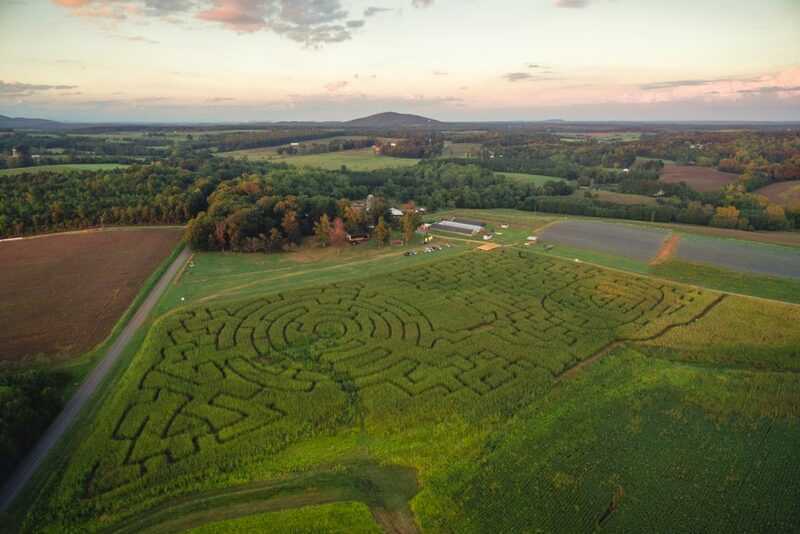 Again you can find those things listed on the Corn Maze page. This year we are also going to be open on Thursday evenings throughout October. We realize that a lot of you have busy Friday’s and Saturday’s so we are hoping being open a few hours on Thursday evenings, might give some of you who wouldn’t normally be able to come out a chance to do so. The plan is to have the same activities available Thursday evenings as we do on Friday’s and Saturday’s. Hours on Thursday’s throughout October will be 3 p.m. till 7 p.m.
Well, here we are at the end of this post. If you’ve made it this far congratulations! Thanks for being a part of our Fall!